Advanced interdisciplinary workflows and extended third-party data interoperability help enhance efficiency while lowering risk and cost. On April 12, the presentation “Resolving Data Integration and Modeling Challenges in the Unconventionals", by Lorena Guerra, became available online as part of the 2016 Virtual Lecture Series. From exploration to development, the key to success in unconventional reservoirs goes hand in hand with an operator’s ability to analyze and dynamically integrate the multi-disciplinary data collected into an integrated earth model. This lecture presents a case study in which interpretation of microseismic data was used to validate geomechanical properties extracted from seismic data. It highlights the integration of multi-disciplinary data to reduce uncertainty by using microseismic events and their relative chronological occurrence as a proxy for fracture propagation, ”connecting the dots”, and validation of the elastic properties derived from a prestack seismic data inversion with the fracture propagation model from microseismic data. 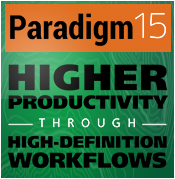 This presentation features Paradigm’s SKUA-GOCAD™ modeling platform. We encourage you and your colleagues to register for this and all the other lectures in the Paradigm Virtual Lecture Series today! Register to view the past and upcoming sessions.